Spaced Out are a Montreal based quintet that play instrumental jazz fusion with strong prog rock influences. The band consists of Antoine Fafard on bass, Martin Maheux on drums, Mathieu Bouchard on guitar, Louis Coté on guitar, and Eric St-Jean on keyboards (the last two only appear on 2 tracks). 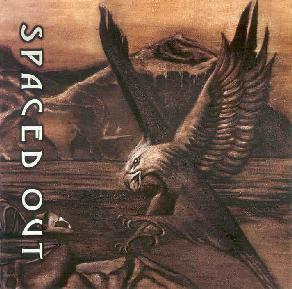 The promo sheets states that Spaced Out's influences include Allan Holdsworth, ELP, and Frank Zappa. Holdsworth is the most obvious influence, particularly from Bouchard's guitar style. But this isn't so overt across every track. Several tracks are pretty firmly in the fusion realm, though the band also do an impressive job of blending fusion and progressive rock, at varying times reminding me of French TV, Ozone Quartet, Volaré... you get the picture. The music has a tightly composed feel, and while the musicians play well together as a band, everyone also gets the opportunity to flex his instrumental muscles. Two of my favorite tracks are "A Freak Az" and "The Fifth Dimension", these being the tracks with Coté and St-Jean. Spaced Out's name is more appropriate on "A Freak Az", the band having created something of a tripped out cosmic fusion tune. Coté's guitar style is different from Bouchard, having more of a jazzy Eddie Van Halen sound. I really like the addition of St-Jean's keyboards and wish he would have contributed to more tracks. "The Fifth Dimension" is the only track featuring both guitarists, and it's a smoker! The dual guitars play off each other beautifully and there are even some bits that have a Mahavishnu Orchestra feel. Probably the hottest track on the disc. In summary, fans of instrumental progressive rock who like a heavy lean in the jazz fusion direction would more than likely enjoy Spaced Out's music. There's nothing new here, but the music has a gorgeous lyrical quality, and the musicianship is rock solid.